The Green Party of San Diego County (GPSD) is the local chapter of the Green Party. Our goal is to achieve electoral gains and to implement electoral and social reform to reverse the immense role big corporations and money play in current US politics. Working for sustainable ecology, universal health care coverage, electoral reform, a living wage, responsible foreign policy, reform of the prison industry, we provide an alternative to the current duopoly in government. The Green Party of San Diego County (GPSD) is operated solely by volunteers and our strength lies in our Local groups that work within their community. We also have county-wide working groups that bring members of various locals together and coordinate our efforts. We reorganized in January 1999 and have been growing since. Our focus is on building our active Green membership and infrastructure to prepare for major electoral campaigns and community projects. In addition, we are beginning countywide campaigns on electoral reform for the next two years. The Green Party of San Diego County (GPSD) is affiliated with the Green Party of California at the state level. The Green Party of San Diego County (GPSD) will establish a Green presence in San Diego County politics and policy debate and will affect progressive change in accordance with the Ten Key Values and the Green Party of California (GPCA) platform. To achieve this, the GPSD will focus on growth and party-building, educating the community on issues and Green Party positions, with a strong emphasis on achieving electoral reform and running local candidates. As the local chapter of the California State Green Party,­ GPSD consists of general members who are registered Greens in San Diego County. Our active members include registered voters and activists, all volunteers, working to promote the Ten Key Values in our community and supporting local candidates who volunteer to run for political office. To become a voting member of the GPSD and affect decisions on policy, elect GPSD delegates or endorse candidates, you must be registered Green and have attended at least one meeting of the general membership within the last 12 months. 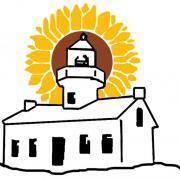 The Green Party of San Diego County logo is a line drawing of the Historic Lighthouse at the Cabrillo Monument with the image of a radiant sunflower in the background. The lighthouse represents the Green Party's desire to become the beacon to lead the community into the Green safe harbor where community and political activism can flourish. The sunflower is used as a symbol by many Green parties around the world. In March 1983, 27 newly elected Die Grünen (Green) members of the West German Parliament, the Bundestag, entered the parliament building wearing bright colors and carrying sunflowers. The sunflower, which grows rapidly and produces many seeds, became the symbol of the new party. Pictures of the event were carried in the media around the world and helped inspire others in the U.S. and other places to begin organizing green movements in their own countries.